Managing a restaurant involves never-ending work. It includes keeping your customers satisfied, serving quality food (and making sure it doesn’t run out), and staying in compliance with laws. Health code violations present a major problem for many restaurants. If you’re found in violation of too many codes, the restaurant can get shut down quickly. But what can you do to avoid these problems? Learn more about the most common violations and how you can steer clear of these, keep your establishment open, and avoid getting shut down. One of the most common reasons for violations of the health code is because of germs your staff carry around. Cooks, servers, bartenders, and even hostesses come into contact with food as a routine part of their jobs. While this isn’t a problem under normal circumstances, it becomes an issue when the flu, colds, and other viruses get passed around freely. If employees fail to wash their hands after using the bathroom, this creates further problems such as food poisoning. For individuals that cook, it’s especially crucial to cut down on as many contaminants as possible. Having workers change into their uniforms at the restaurant can reduce problems related to outside germs. Encourage all staff members to wash their hands to the repetition of “Happy Birthday”, twice in a row. This coupled with watching how the food gets handled can keep the health inspector from issuing warnings. Chemicals and food present a dangerous combination in any setting. But if you’re a restaurant and you’re serving customers food that was on a clean, but unsanitized, surface, you’ll have problems with the health inspector. Many people assume that once something was cleaned, it’s safe to use, including cooking, chopping, or working with food in any manner. While it’s important to clean surfaces with hot, soapy water and rinse them thoroughly, there’s a third process that’s just as important. Sanitizing dishes and surfaces gets rid of unseen germs that can cause illness or get carried over to infect customers and staff alike. To prevent this issue from happening, make sure the staff gets trained accordingly. Have procedures in place for new workers that cover this. Consider having a re-training for all employees and keeping the proper procedures in one place so it’s easy to review. It’s easy to violate health code in regards to cooking food. With a variety of different dishes and all of them needing their own temperature, it’s easy to not cook something long enough to kill any bacteria present. Foods that are intended to get served cold should not go above 40 degrees Fahrenheit. Anything served hot needs to be cooked depending on the type of meat in the dish. For example, chicken needs to be cooked at least at 165 degrees to kill all bacteria, but beef and other meats can get cooked at lower temps. It’s important all incoming staff has proper training. Cooks or other kitchen workers know the basics of what temperature to cook meat at. They also need to know how to keep items cool until they’re ready to get served. If you’re not sure about how to handle this situation or you’ve run into problems in the past, it’s best to speak with a consultant educated in food safety. They can review your kitchen and find out where you’re running into difficulties, and advise you on how to change it. Storing food is another important aspect of avoiding health code violations for your restaurant. There are certain items that shouldn’t get refrigerated. Take notice of how meats and vegetables are currently stored and if they meet proper standards. The rule is generally raw and cooked vegetables stored closest together at the top. Next would be cooked meats. This includes seafood and meat. Finally, raw meats and seafood should be stored further away from everything else, and at the bottom of the refrigerator. This prevents the spread of bacteria from dripping on items and the cross-contamination of germs. Proper storage makes it easy to avoid getting written up for a violation. While it’s not necessary for a restaurant to use gloved hands for the handling of food, it is imperative that everyone washes their hands. This is regardless of wearing gloves or not. Some folks think they can skip hand washing because they’re wearing a protective covering. Others believe they can wash the gloves when moving between dishes getting cooked. Both ideas provide a false sense of security. Insist that regardless of whether gloves are used or not, that everyone washes their hands before and after handling a new dish. Doing so cuts down on instances of bacteria getting spread. 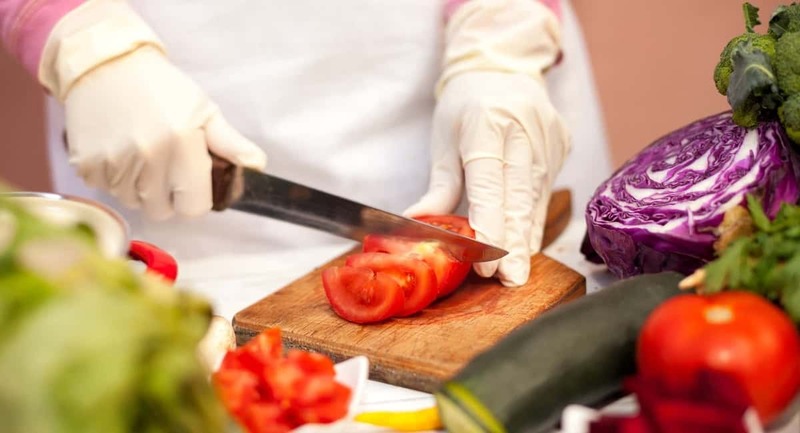 When running a restaurant, it’s important to know about the most common types of health code violations and how to prevent them. Doing so keeps you from running into issues that range from bad press to getting your restaurant shut down by the health department. If you’re in the clear, you can avoid these problems and feel confident you’re running a restaurant everyone wants to visit. If you’re interested in learning more about the food service industry, check out our blog post. See how Florida’s restaurant industry is booming and continues to experience growth.